As mentioned in the vintage horror article, here is a guide to the best of Hammer Horror films. It’s a name that isn’t as familiar as it should be in film circles, mainly because critical overviews often find the more snobbish of film reviewer calling them too tongue in cheek or camp. Hammer Horror films are so much more than this though and I hope to convert a few to the cause. Hammer were initially just an average film company, often making the usual dramas and films in the late 40s and early 50s. It’s not until they journeyed into the, at the time rather dead, realm of horror cinema that they earned their fame and fortune. Mixing Gothic adventures with classic villains and monsters, Hammer created a breed of horror accessible to all, even for those with a fear of the bloody and the gory. Their first proper horror film The Quatermass Xperiment is the perfect starter film though only three other films from the Hammer output are similar in tone. Based on the hit BBC Sci- Fi drama, we follow Professor Quatermass as he tries to stop an invasion from a parasitic alien that came back to Earth using a human host from one of the professor’s rocket experiments. It’s brilliant and kick started a new wave horror that lasted well into the 1970s. Don’t expect any visual effects extravaganza though the effects in general still stand up rather well having been shot in a lovely crisp black and white stock. There’s been a recent release of this packaged with its sequel, Quatermass 2, which is also another brilliant cold war paranoia, Sci- Fi thriller. It’s available for about £5 but earlier copies of it which is stocked full of super extras that geeks like me find wonderfully exciting. Along with this recent release, The Abominable Snowmen and X: the Unknown are also out as part of the series. Both are the same sort of fair but the former boasts Peter Cushing, one of film’s best but most underrated of actors, and so has the upper hand. X: the Unknown is quite similar to The Quatermass Experiment too so if you enjoyed that, try this one out. Both of these are available for about £4 each online. It’s from here that Hammer horror took a turn for the Gothic. A trend which they stayed with until their output pretty much ceased. 1957’s Curse of Frankenstein is a monumental piece of horror showcasing both Christopher Lee and Peter Cushing in definitive roles. It’s also the best colour horror film of the fifties and the gorgeous use of a red and green colour palette make it a lovely, cosy night by the fire sort of film, perfect for winter nights and Halloween. It’s here that Cushing and Lee both became pretty regular in Hammer films. This is most definitely a good thing and the best hammer films often contain at least one of them, if not both. 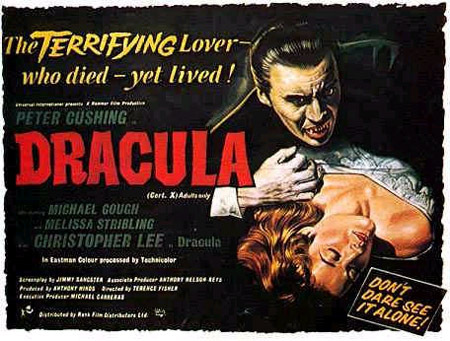 The Hammer remake of Dracula showcases this nicely with Lee as the Count and Cushing as Van Helsing. It’s one of the best vampire films ever, only topped by two other hammer Dracula sequels that we’ll discuss later. Their remake of The Mummy is also worth a watch though doesn’t stand up as well as the previous two films. All of these are together simply because of a box set that contains all three of these films. The former two films are probably the best Hammer has to offer so is a vital purchase. However due to the rarity of the set itself, it can cost up £80 to buy new. However I managed to get mine on Ebay for £25 and if the films sound like they really could be your cup of tea then they’re online in various places. After the success of The Curse of Frankenstein and Dracula, Hammer started a run of sequels to both films which also lasted the whole span of Hammer itself. Unlike sequels to other films though, these sequels were occasionally better than the original film and the quality ran pretty high up until the 1970s. Dracula’s sequels are probably the strongest so we’ll start there. Brides of Dracula is a direct sequel to the story, though follows a different strain of vampires. It’s slightly camp but is a highly enjoyable adventure film with some ingenious methods of stopping vampires and Peter Cushing again leading the fight against the fanged fiends. Dracula: Prince of Darkness is probably my own personal favourite Hammer horror. This time we follow on from the story where the first film left off even providing a recap of the story so far. Lee is back as Dracula and the action is full on from start to finish. It also has a brilliant performance from Barbara Shelly whose portrayal of Helen as she turns from a boring, moaning person into a fully fledged vampire, is the best performance of a vampire in the whole Hammer stock. Dracula Has Risen from the Grave is yet another sequel and does very little new that the previous three films hadn’t done already. However it’s an enjoyable watch and manages to entertain in a typically Gothic Hammer way. All three films are available extremely cheaply online. There are plenty more Dracula sequels and Frankenstein for that matter (Check out Revenge of Frankenstein and Frankenstein Created Woman) but there aren’t enough words to cover them all so now we can move on to some other monsters. The last two films to mention are both extremely different. However, their collective ideology means that they’re all clearly Hammer films and are all visually very similar. The Plague of Zombies is rather nice, little classic horror about having to use zombies to work the mines. It’s quite similar to White Zombie (a classic zombie film from the 1930s with Bela Lugosi) but it’s far more visually pleasing with some creepy dream sequences and some quite shocking gore for the time. The Reptile is an entirely different beast, concerning mysterious murders apparently committed by a strange lizardman. It’s a film strewn with madness but the fact that everyone plays it completely straight means that it works well and we believe, even when the reveal of the lizard man itself isn’t strong. Both are available from the huge Optimum Hammer collection for around £4 online. Hammer have made a lot more films than covered here. It’s taken a full book (The Hammer Story by Marcus Hearn and Alan Barnes) to cover all their films in depth and detail but this should act as a springboard for people fed up with horror being too brutal and serious. I’ve neglected some of Hammer’s biggest titles here (there are at least 15 more to potentially mention…) so it’s up to you dig them up.